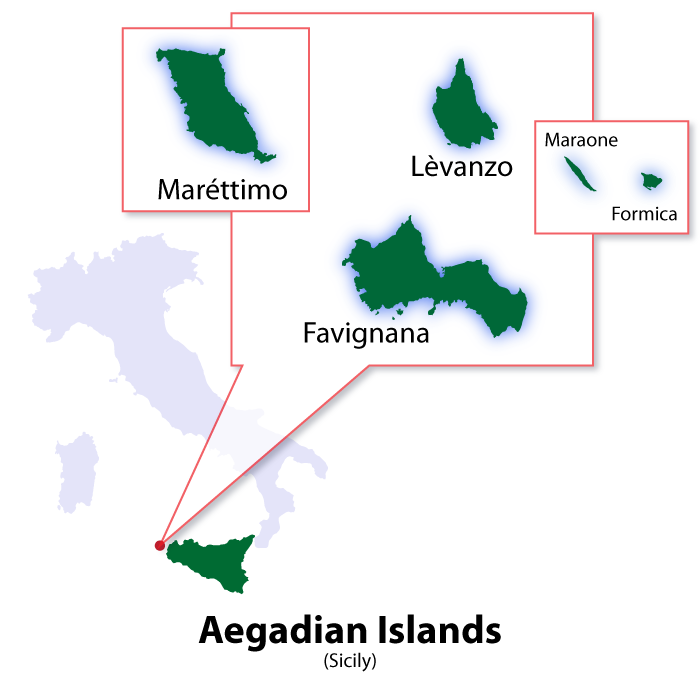 The Aegadian Islands (Egadi) consist of three main islands, and two smaller ones, located off the west coast of Sicily between the coastal towns of Trapani and Marsala. 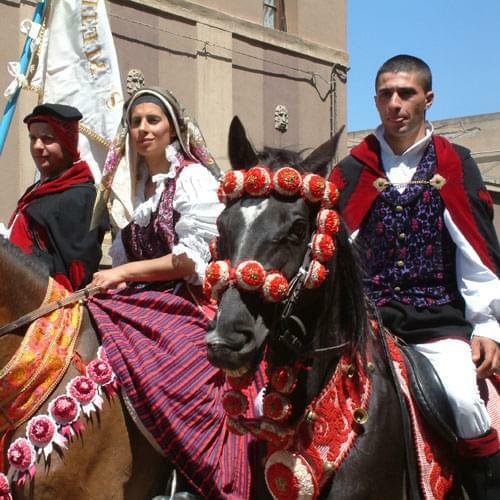 Of the main islands, Lèvanzo, originally called Phorbantia, is the closest to the mainland, lying approximately 13 kilometres from Trapani. 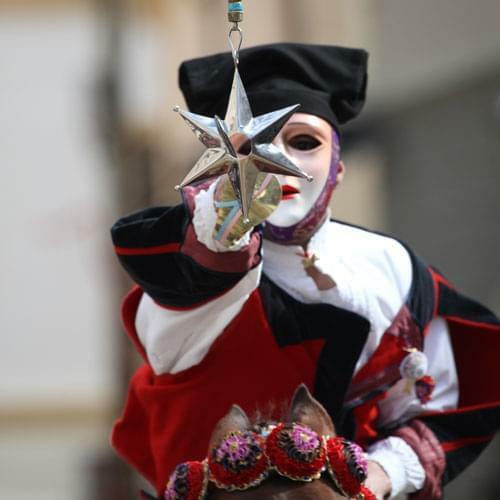 Slightly further south lies the largest of the main islands, Favignana, originally called Aegusa, and further to the west, 24 kilometres from Trapani, lies the most remote island, Maréttimo, originally known as Iera Nesos. 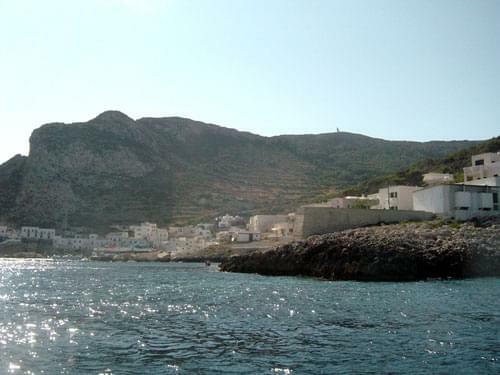 The two smaller islands: Maraone and Formica, lie between Lèvanzo and Trapani. The islands have a long history dating back to Paleolithic and Neolithic times and there are cave paintings still visible on Lèvanzo. The most significant historic event that took place in the area was the decisive sea battle of the first Punic war, when the Carthaginian fleet was defeated by the Romans. Sicily subsequently became a part of the Roman empire. Although ownership of the islands has changed over the centuries little else has changed. There are approximately 5,000 inhabitants spread around the main islands where the principal occupation is fishing. 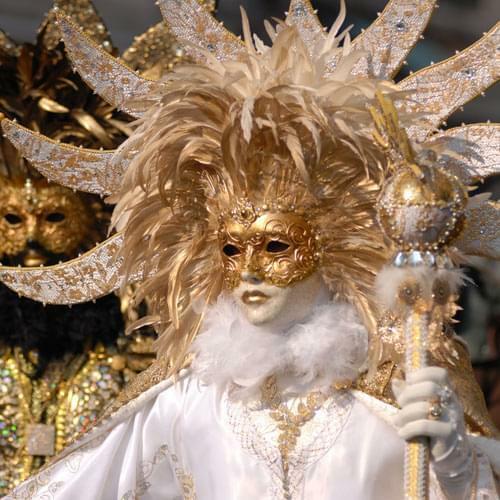 The islands were owned at one time by the Florio family from Palermo who became wealthy exporting Marsala wine. They developed the island of Favignana and built a tuna fishery, the largest in Sicily, which is now abandoned. 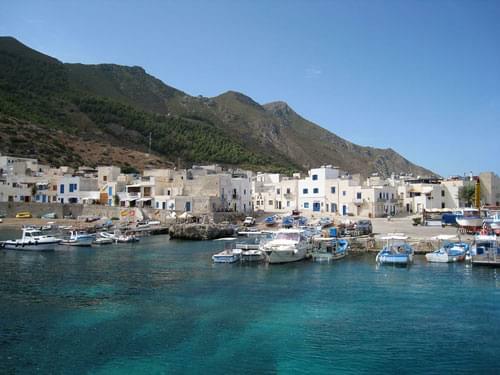 Favignana was the centre of the traditional annual tuna cull, 'La Mattanza'. Although relatively undeveloped and low-key, and perhaps because of that, the islands are a popular tourist destination in the summer months. 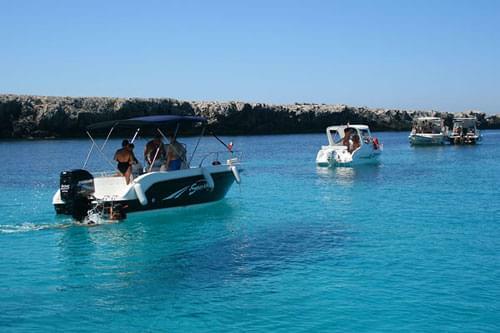 Their main attraction is the crystal clear water and idyllic coves and bays which are ideal for all kinds of boating, swimming, snorkelling and scuba diving. 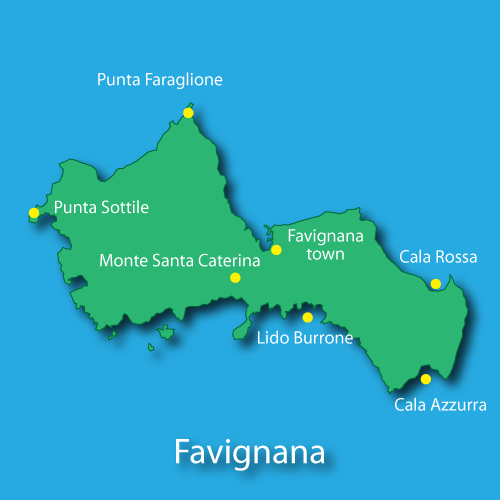 Favignana is the largest of the Aegadean islands, and is approximately 20 square kilometres in area with a population of around 4,000. To the west of the island, the terrain is rugged, with the highest point just over 300 metres at Monte Santa Caterina. 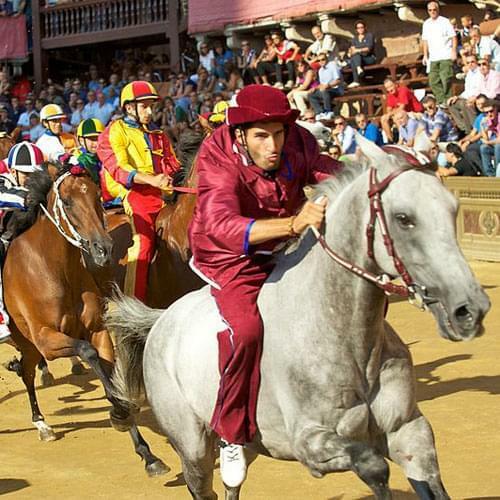 On the top of the mountain stands the Fort of Santa Caterina, which represents the colourful history of the islands. Originally a Saracen fort, it was developed by the Normans, then used as a Bourbon prison and is now under Italian military control. The eastern side is flatter and more gentle. 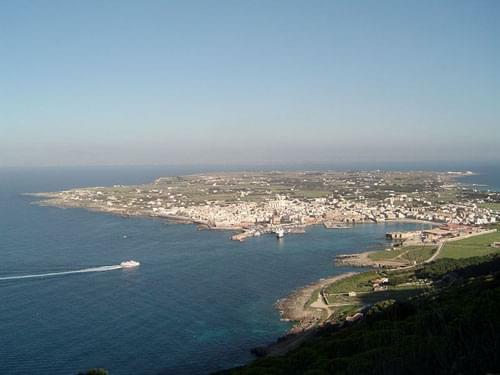 The main town, also called Favignana, is to the north of the island and is where visitors arrive by ferry. A number of buildings built by the Florio family can still be seen in the town as well as the abandoned tuna factory. The generally rugged coastline is interupted here and there with pretty coves, bays and some small stretches of sandy beaches. There are beaches all round the island, but the principal ones are Cala Rossa, Cala Azzura and Lido Burrone. 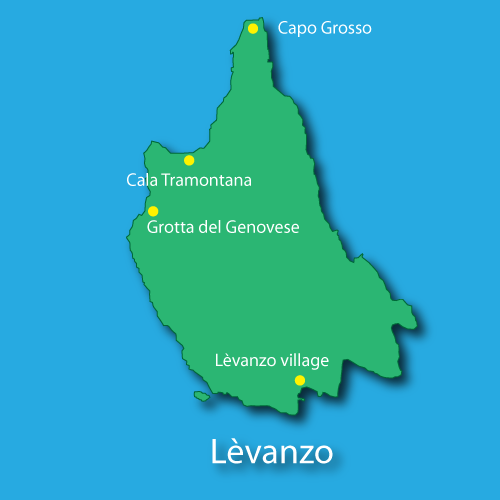 Lèvanzo is the smallest of the main islands and the closest to Trapani. It is only 6 square kilometres in area and has a population of just over 200. 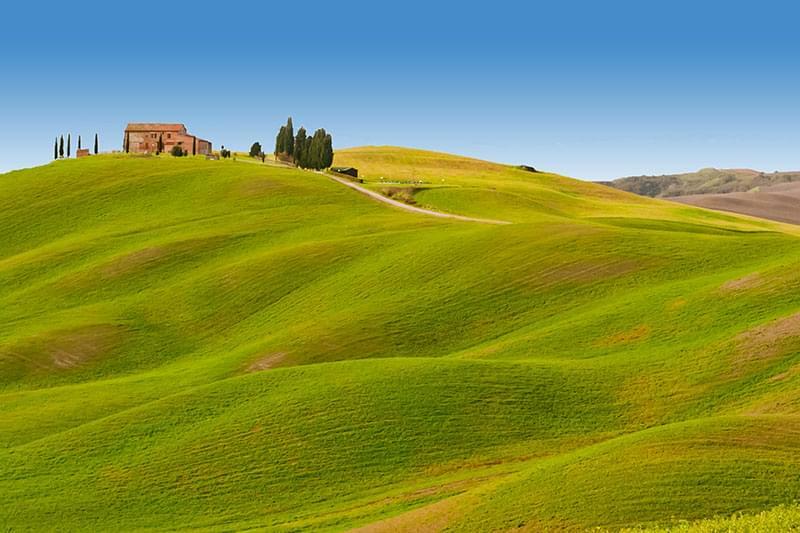 It has little to offer tourists except total peace and tranquillity, which is perhaps the most valuable thing of all! Lèvanzo's main claim to fame is the 'Grotta del Genovese' where a series of Neolithic cave paintings were discovered by a visitor to the island in 1949. 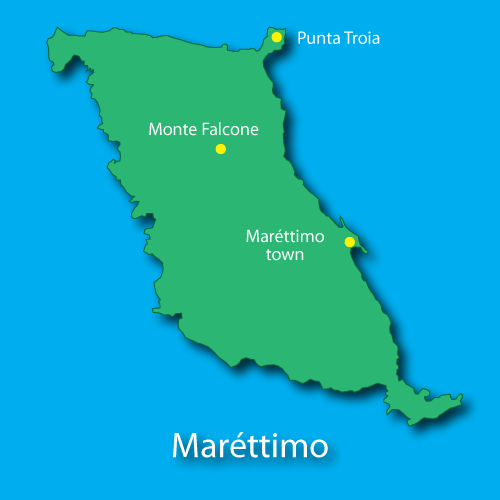 The third of the main islands is Maréttimo, the furthest from Sicily. It is 12 square kilometres in area with a population of about 700, although this drops during the winter months. Maréttimo is mountainous with the highest point at Monte Falcone of 686 metres. Like the rest of the islands, Maréttimo is a haven of peace and solitude with a series of rocky coves and crystal clear water.